"The revised catalog pages look great. Thank you for making the changes. You guys beat all the competition by far. Your customer service is unbelievable." Catalogs are a ubiquitous part of many companies' marketing initiatives, and are one of the most powerful marketing vehicles for getting the word out about products and services. Think about it: we receive catalogs in the mail and pick them up on the way out of stores. They even come in the packages we receive, allowing us to peruse and shop after the initial sale. And many times, catalogs continue to stick around, found on our counters with dog-eared pages and favorite products circled or marked. But not every catalog we receive sticks around for long. Some get a hasty glance, while others are not even cracked open before going directly into the recycling bin. Just because you put everything and the kitchen sink in your catalog doesn't mean every potential customer who gets it will spend precious time poring over it, especially if it is boring or lacks direction. Eye-catching design, smart layouts, appealing images and organization are cornerstones to good catalog design. Add in the fact that different industries usually require different approaches: a big box sporting goods store's catalog will look very different from a custom watch-maker's. Consider this before diving in, as one size does not fit all in the world of catalog design. So, where do you start? Let's look at a few key ways to get a jump start on your catalog design with best practices. A catalog's performance is tied to how well it sells. Tailor your catalog design to appeal to your target customer. If your target is a young audience it will be drastically different than a catalog for older folks. If you target multiple audiences you may consider doing multiple designs to match the style and desires of your audience. Give your products the space that they need. When designing your catalog, make sure it is large enough to showcase your all of your products and draws attention to your most important products or services. Consider the page count, format and how it will make your customers feel. For example, if you are in a niche industry like custom watch-making or fine photography, you may want an austere layout with fewer items per page, highlighting the quality and uniqueness of the work. Additionally, this kind of audience would probably also benefit from a higher quality paper stock, more careful consideration of image quality and color trueness. You will want your customers to linger over the pages, taking in the details and the "story" of your work. A good place to get expert advice is from your favorite printer. At PrintingForLess, we provide printed samples, technical help and guidance on how to get the best printed piece. Images of your products and services are the centerpiece of your catalog. Consider making images of high value products and services larger than those of products of lesser value. Great photos will make your products more appealing and increase sales. Make sure all your images are taken with good lighting and are of an adequate resolution for printing. We recommend 300 dpi or above for all images. More information on image resolution can be found here. What sold like crazy? Where was it in the catalog? Were there any "duds" and where were they located in the catalog? Did the overall look and feel of the catalog help or hinder your sales? How quickly did you start seeing sales after your catalog release? Also, be sure to ask your sales people how the catalog is doing, or for feedback from customers. As you can see, a catalog is a process that takes time, commitment, patience and testing. And while all of this may seem daunting, once you get your system wired, you can use it over and over again. The right catalog formula will help drive sales and keep your customers coming back for more! See more catalog designs showing different catalog design and marketing ideas. 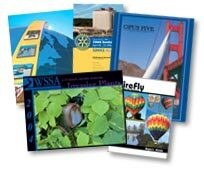 Need a custom catalog size or format?